Dhanuzya Pada-1 can show Brihaspati's rulership of 1-embodiment + 4-cultural foundations. + Guru enjoy high-compatibility yang patterns which stimulate creativity and authority. Pada-1 tends to be paternalistic, creative, self-referential to the point of self-righteousness, and generously friendly. Iconic and inspirational teachers of the patriarchal lineages are found here. Assess the role of Brihaspati to determine character. A woman born in Pada-1 is likely to teach- preach via her husband, although other arrangements are possible. during the entire day on Friday 12-Jan-1917, uttama-Mangala is very strong in shad-bala. Makara-Mangala accepts drishti of Pushya-Shani-8 occult high priesthood (Shani in a nakshatra of Shani). The Maharishi-Mahesh-Yogi was a skilled businessman (uttama-Mangala) who created a multi-billion dollar global educational and commercial empire teaching (selling) mystical practices in a form accessible to the hoi-polloi (Shani). Rahu occupies the lagna of each of the 16 Parashari varga. on the day of Zukra to have Professor Bright Bhrigu-yuti-Surya-yuti-Rahu-Dhanuzya with this cluster receiving drishti of Guru-Meza whilst the Magha Chandra also receives this same philosophical Guru drishti seems like an appropriate fit for the historical record of this individual. during the entire day on Saturday 12-Jan-1918, Mangala-Kanya has lost His leadership acumen and Chandra occupies Purvazadha, no longer associated with out-of-body states of consciousness. Shani furthermore has entered Azlesa . Guru having advanced into Vrishabha-Krittika no longer so richly supports the nativity, because from Vrishabha, Brihaspati's Parashari drishti reaches only the criticizing, arguing Kuja-Kanya. dharmesha-9 Surya-1 = affiliated with public worship, religious activities. Chandra-9 Magha = a high magus, magister, master of the shakti to consciously come and go from the body at will. uttama-Mangala in bhava-2 very strong for wealth accumulation. dynamic physical energy directed toward traditional historical lineage knowledge via speech, song, oral histories. Kuja-yuti-Budha, direct and dynamic delivery of instructions, descriptions, explanations, arguments. Budha rules 10th navamsha + uttama-Mangala = a direct and socially regular, corporate-style trainer . In Makara, Budha disfavors unnecessary speech, but a special talent is given for delivering instructions as "rules " (Makara). Quick grasp of social structures and public conventions. Vriddhipathi-11= Zukra- 1 = 3rd from swakshetra = self-made earnings. vidyapathi-5 Mangala in 2; dharmesha-9 Surya in 1; Vriddhipathi-11 Zukra in 1 = significant dhana yoga pattern. 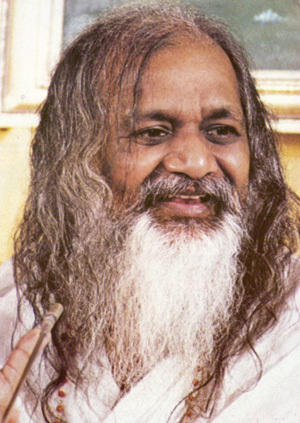 According to http://en.wikipedia.org/wiki/Maharishi_Mahesh_Yogi, "The reported value of the Maharishi's organization has ranged from the millions to billions of U.S. dollars and in 2008, the organization placed the value of their United States assets at about $300 million." Vriddhipathi-11 Zukra in bhava-1 yuti Rahu = marketplace (11) ambitions.. Vriddhipathi-11 economic systems = Zukra (harmony) yuti Rahu (exotic) + Surya (bright center). Zukra + Surya = bitter enemies; Rahu Eclipser + Surya Shiner also = bitter enemies. It is an internal challenge to reconcile the personality elements in this lagna however external Rahu + Zukra + Surya is an attractive, pleasant, exotic, and fascinating character. dhanapati-2 + bhratrupathi-3 in 8 = assets hidden from government (Shani) taxation; bhratrupathi-3 indicates that much of the hidden wealth is self-earned in commercial business, via delivery of instruction or sales of product. Rahu in bhava-1 passion for vitality * in swabhava of Competitive Kuja, the Shadowy Specter seeks privilege via glamorous, exotic, or mesmerizing physical visage extraordinary athletic movement, Craves an identity of exceptional appearance, exhilarating energy, championship. Seeks social mobility via vital, dynamic muscularity. Exciting, opportunistic, ambitious conditions of Earth-birthh. A fascinating figure * a remarkable individual. May become a focus of a cult of personality. Rahu in lagna in each of the 16 Parashari varga. Ketu-7 taking drishti of Zukra + Surya contributes to nebulous, cloud-covered, incoherent, socially disconnected style of sexual coupling. The sexual behavior is inconsistent, unfocused and disregards social conventions. yuvatipathi-7 in 8th from 7 suggests the transformation of the married energies into business pursuits (Mangala-Budha in 2).